� When Bourne won his first FIVB gold medal in Berlin in 2014, he also set other FIVB records. As the 27th-seeded team, it marked the lowest combined seeds in a final as they defeated the 24th seeds. � Bourne's FIVB gold medal in Berlin in 2014 marked the first time in FIVB history that all three podium teams came from the qualifier, and was the first all-USA men's title match since 2012. � Bourne's 2014 Berlin win also marked the largest age differential of winning partners as Bourne was 25 years, 0 months and 2 days old while partner John Hyden was 41 years, 8 months, 15 days. � Entering the 2016 season, Bourne had advanced to the semifinals in 14 of his last 15 AVP tournaments. � Bourne is the only AVP player to rank in the top five in blocks and kills in each of the three seasons from 2013-2015. 2015: Bourne and Hyden played in four AVP events, advancing to the semifinals each time. The duo placed third then second before winning the last two events. Bourne ended the year third in hitting percentage (.476), third in kills per set (7.24), fifth in blocks per set (1.65) and sixth in aces per set (0.61). Bourne and Hyden competed in nine FIVB events together, with a best of fifth three times. 2014: Bourne competed full time on the FIVB Tour for the first time, playing with Hyden. The duo had a pair of ninths in their first four events after having to first play in the qualifier three times. In their fifth tournament, the Berlin Grand Slam, they won all eight matches (losing just one set) and claimed the first gold medal for either player. For the season, Bourne and Hyden played 11 FIVB events, and in addition to the win also had three fifths despite having to advance from the qualifier six times. On the AVP Tour they played in all seven events, advancing to the semifinals six time and winning once. Bourne and Hyden finished as the second-ranked team on tour. Bourne ended third in hitting percentage (.460), fourth in kills per game (6.90) and fifth in blocks per game (1.74). 2013: On the AVP Tour Bourne began playing with John Hyden. In seven events the duo advanced to four semifinals, including second-place finishes in the last two tournaments. They ended the year tied as the second-ranked team on the AVP. Bourne was fourth in blocks per game (1.77) and second in kills per game (7.69). On the FIVB Tour Bourne and Derek Olson advanced through the qualifier in the season finale in South Africa, and placed fifth in what was the first FIVB event for both players. Bourne and Hyden also played in three NORCECA events, with a pair of seconds, then Bourne played once with Nick Lucena. 2012: Bourne began his pro beach career by playing nine tournaments across four different tours with four different partners. 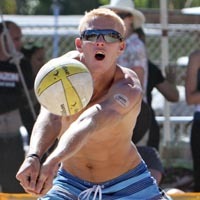 He was eliminated in the qualifier of his only AVP event, but had a best domestically of seventh with Jeffrey Carlson. He and Will Montgomery placed second in a NORCECA event. College: Bourne played at Southern Cal, where he was an opposite hitter, outside hitter and libero. A versatile player, he set a school record for most 20-dig matches in a season. During his sophomore year USC was the NCAA runner up and finished third in 2011 during his senior campaign. Bourne was selected to the NCAA All-Tournament Team in 2011. Indoor: Following graduation, Bourne competed on the U.S.A. National Team in the Pan American Games, then played two seasons professionally between Puerto Rico and Turkey. Personal: Bourne is the youngest of four kids, as he has one brother and two sisters. Both his father (Peter) and mother (Katy) were triathletes, hence his name, and Peter played football at the University of Hawai'i. His sister Kai was a water polo player in college while sister Britta was a collegiate soccer player. In high school Bourne's team won the state championship. In addition he played basketball and was the Honolulu Co-Player of the Year along with Riley McKibbon. Bourne and McKibbon won the gold medal at the 2007 AAU Junior National Beach Volleyball Under-20 Championships, then became teammates at USC.